Romantic exclusive helicopter flight in Fiordland National Park: What could be more romantic that just the two of you a top an Alpine Mountain with a picnic and bottle of champagne. There’s no better way to experience the Fiordland National Park than by helicopter. 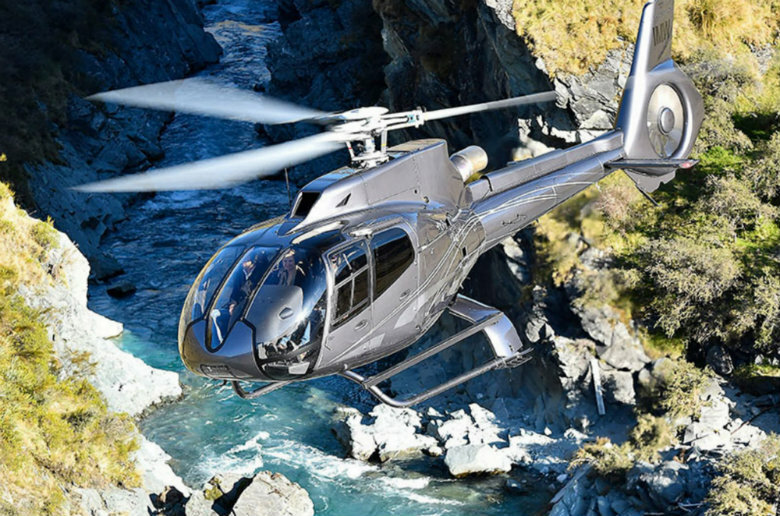 Why not upgrade and make the experience an exclusive one, just the two of you and a pilot, fly across Lake Wakatipu from Queenstown and into the heart of Fiordland National Park to the breath-taking Lake Quill and the Sutherland Falls. With views of the Milford Track and out to the Tasman Sea and West Coast. Fly the length of Milford Sound viewing gushing waterfalls, and sheer cliffs. Land upon Mt Tutoko Glacier, an awe inspiring experience. Your pilot will land in the remote alpine wilderness for a romantic picnic lunch with Central Otago wine. If helicopters aren’t your thing then you can find other ideas in our top New Zealand experiences article. Hot Air Ballooning: On a romantic hot air balloon ride, you and your loved one can experience some of New Zealand’s most beautiful sights. You and your partner can gently float in the breeze, and experience total peace and isolation, whilst achieving a birds eye view of the scenery below. With just the wind as its navigator, a balloon ride will give you the chance to take in stunningly romantic panoramas while spending quality time with your loved one. Generally trips depart at sunrise, adding to the romance, once your balloon lands, you can enjoy a champagne breakfast. 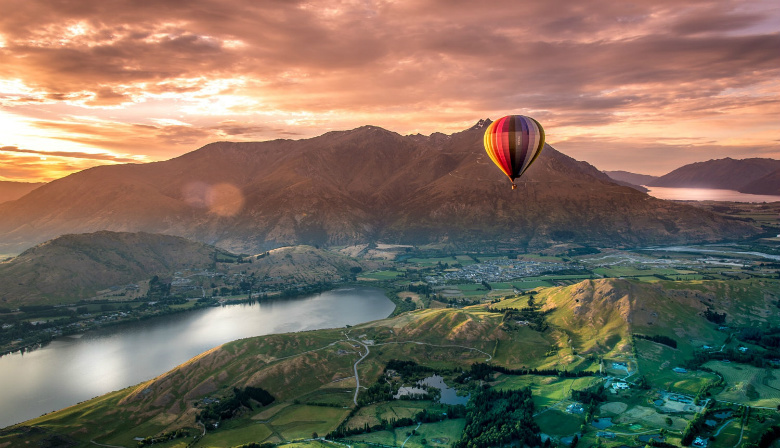 Hot Air Balloon rides are available in several locations around New Zealand including Queenstown, Canterbury and the Hawkes Bay. Onson Hot Pools Candlelight Spa Experience: After a day experiencing all Queenstown has to offer, what better way to relax than a soak in a hot tub! 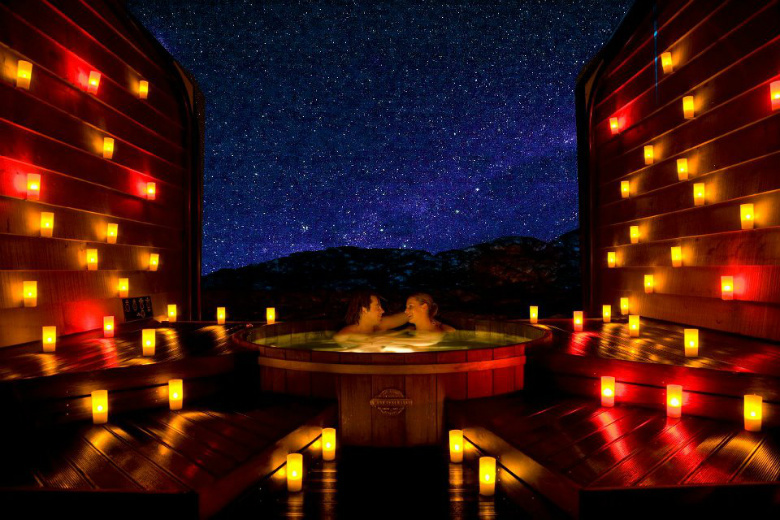 We can arrange a private hot tub for just the two of you, complete with candles. Relax with a glass of chilled champagne by candlelight, this magical and romantic experience is all about unwinding and soaking-up Queenstown’s spectacular scenery, at the touch of a button the front wall retracts and puts you amongst an amazing scene, starlit skies, with a mountain back drop. An inexpensive way to end your day and a romantic New Zealand honeymoon treat. 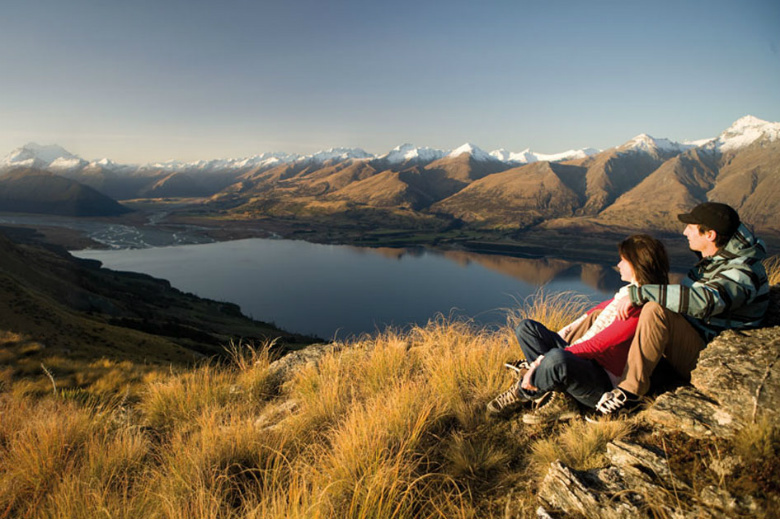 Romance in the Mountains, Wanaka: Enjoy a private 4WD safari to an exclusive alpine location, just the two of you, time alone with that special someone, high above Lake Wanaka. Leave the hustle and bustle behind and enjoy a private audience with the mountains, a chilled bottle of Central Otago’s finest bubbly and canapes to keep you company. This is one romantic adventure not to be missed! Couples Massage or spa treatment: Experience a luxurious pampering massage in the privacy of your room, a perfect way to finish your day. The Luxury Adventures team can arrange private couples massages or spa treatments in most of the lodges and hotels around New Zealand. Or chose the natural way and soak in the geothermal hot pools of Rotorua and Taupo in the soothing alkaline mineral water pools. Private rooms can also be arranged. Romantic Private dinner or picnic: So many options! The Luxury Adventures team can arrange romantic dinners on mountain tops, private beaches or on a private yacht to name a few. In the comfort of your room or luxury villa, a snug library or study at Huka Lodge, wine cellar at Blanket Bay, Cape Kidnappers, your own private deck with stunning views of the Marlborough Sounds at The Sounds Retreat. Private rooms are available at some of the top restaurants in Auckland and Queenstown, perfect for honeymoons, birthdays or anniversary celebrations. 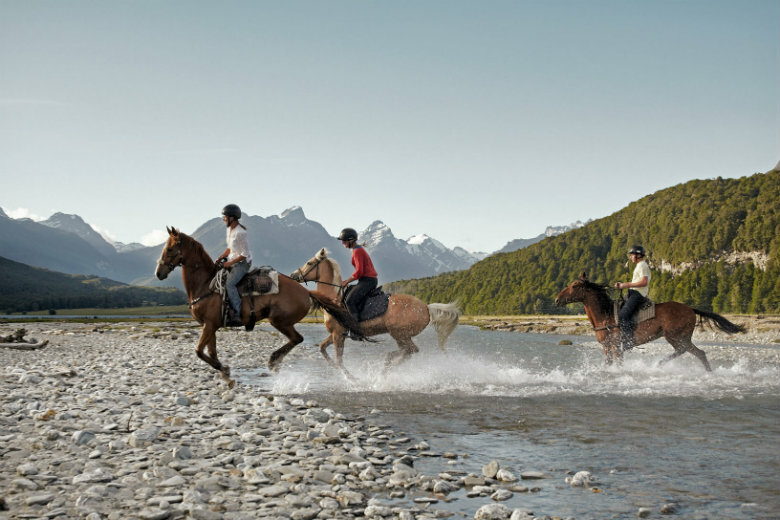 Horse Trekking: There are horse trek options in most of the key destinations, Queenstown, Hawkes Bay, Wanaka, Northland, Taupo etc, an excellent way to explore the great New Zealand outdoors. Our team can organize a privately guided trek to suit all riding abilities. Imagine the two of you riding off into the sunset, stunning snow capped mountains, beach or river vistas. We can arrange a romantic picnic stop with bubbles, just the two of you cozied up on a blanket sipping New Zealand wines and soaking up the stunning views! 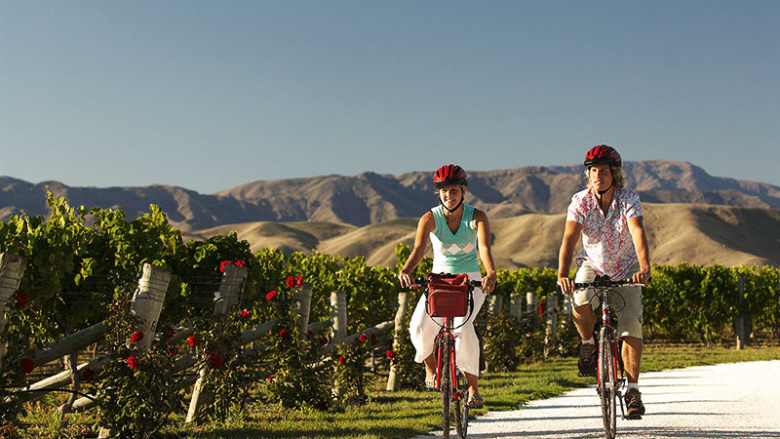 Bike the Vines: Another great way to explore New Zealand wine country and taste some of our fantastic varietals! Our team can arrange guided bike rides around the wineries and vineyards of Queenstown, Nelson, Wanaka, Marlborough and the Hawkes Bay. There are different options to suit your travel budget or other needs. You can choose between privately guided, go with a small group, or just the two of you, with your bikes, helmet, map, and a picnic. Find a secluded spot among the vines to enjoy each others company and your wine purchases!